The CWA represents public water utilities that are regulated by the California Public Utilities Commission (CPUC) and serve nearly 6 million people in California. 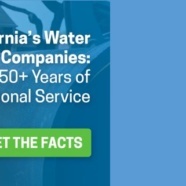 The purpose of the new site is to highlight the more than 150 years of exceptional service to Californians by regulated water companies and to dispel activist misinformation about the independent regulatory oversight process of the CPUC. The site features a toolkit of resources, including an infographic explaining the CPUC’s rate-setting process, answers to frequently asked questions, and responses to inaccurate claims made by some activists in the state. Another part of the toolkit is a factsheet that details California water companies’ infrastructure investment and commendable record of service. Activists in California have often mischaracterized the comprehensive, independent, and highly stringent regulatory oversight of the state’s water companies. This is often done in an attempt to bolster talk of hostile government takeovers of regulated water utilities in the state. Yet, the historical record confirms that Californians are well served by regulated water companies, and that the regulatory oversight process works to the benefit of customers. In 2017 alone, California’s regulated water companies invested more than $645 million combined in community water and wastewater systems and are leading the way in addressing the state’s unique water challenges with technological advances and conservation efforts.